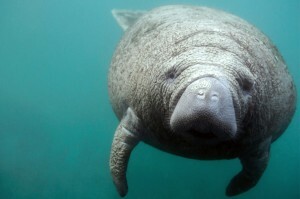 Manatees are commonly called Sea Cows. They are massively cute—so ugly they’re irresistible—and gentle. Ranging in color from gray to brown, they are covered with wrinkles and short bristle-like hair, and sport long thick whiskers jutting from their snouts. They do not have eyelashes. They look jaunty in sunglasses. One largely unknown fact about them is that they crave ice cream and Hawaiian shave ice. Really. Well, maybe only Gus. Who’s Gus? Click here to meet Gus. Anyway, manatees are plant eating aquatic mammals with bodies that taper to a flat, paddle-shaped tail. They have two forelimbs, called flippers, with three to four nails on each flipper. Their head and face are wrinkled with whiskers on the snout. 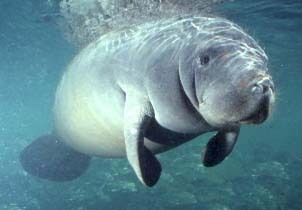 The average adult manatee is about 10 feet long and weighs between 800 and 1,200 pounds, although they can grow as large as thirteen feet and weigh more than 3,000 pounds. Adult females are generally larger than adult males. The manatee’s closest relatives are the elephant and the aardvark. Really. Again. Pretty amazing animal. Full of surprises. Like Gus’ taste for ice cream. Manatees can be found in shallow, slow-moving rivers, estuaries, saltwater bays, canals, and coastal areas — particularly where seagrass beds or freshwater vegetation flourish. Manatees migrate depending on the season. They are concentrated in Florida in the winter, which is where the Powers family became acquainted with Gus and his family. In summer months, they can be found as far west as Texas and as far north as Massachusetts, but summer sightings in Alabama, Georgia and South Carolina are more common. They cannot survive in water colder than 68 degrees—neither can Ann. Manatees are gentle and slow-moving animals. Most of their time is spent eating and resting, kind of like the Powers family. They can consume 10-15% of their body weight in vegetation daily—like dad. Because they are mammals, they must surface to breathe air. They may rest submerged at the bottom or just below the surface of the water, coming up to breathe on an average of every three to five minutes. When manatees are using a great deal of energy, they may surface to breathe as often as every 30 seconds. When resting, manatees have been known to stay submerged for up to 20 minutes. Manatees can swim up to 20 miles per hour in short bursts, but they usually only swim about three to five miles per hour. By using both their tail and flippers, manatees are capable of complex maneuvering including somersaults, rolls, and swimming upside-down. 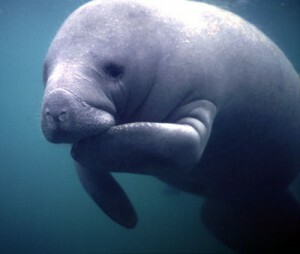 A manatee typically swims with up-and-down motions of its body and tail, like a whale or dolphin. Because it is slow moving, it is often struck by powerboats which speed through its habitat. Manatees have no natural enemies, and can live 60 years or more. One calf is born every two to five years, and twins are rare. A newborn calf is 3-4 ft long and 60-70 pounds. The gestation period is about a year. Mothers nurse their young for one to two years, during which time a calf remains dependent on its mother. 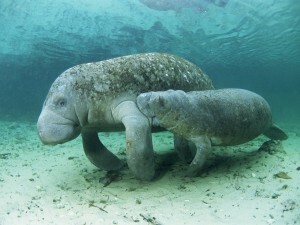 Manatees use various forms of communication in the water such as sound, sight, taste and touch. Manatees have an acute ability to hear and squeals are often used to keep contact between a mother and calf. They have fairly good vision and can distinguish between colors. You can get more information on manatees and what you can do to help these magnificent creatures from the Save the Manatee Club. They are very snuggly and cuddly. You can buy one for hugging from our online store. Click here to purchase. One Response to What’s a Manatee?